question_answer1) Choose the number name. question_answer3) How many toys of Rs. 40 each can Raju buy with Rs. 100? question_answer4) What is the sum of 3 tens 6 ones and 2 tens 9 ones? question_answer5) Anshu is standing in a queue. He is the fourth from the front and fifth from the back. How many children are there in the queue? question_answer6) The papaya weighs about ______ . question_answer7) Joy has 6 shirts. Jai has 3 fewer shirts than Joy. How many shirts does Jai have? question_answer8) Which is the correct ascending order? question_answer9) Rani's bangles are hidden in a bag. Which bag is it? question_answer10) There are 15 boys and 3 girls in a class. They sit in 3 equal rows in the hall during a concert. How many children are there in each row? question_answer11) How many triangles are there in the figure? 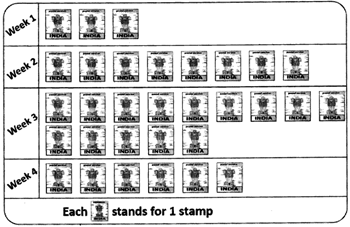 question_answer12) The picture graph given shows the number of stamps Rana collected in four weeks. How many stamps did Rana collect in four weeks? question_answer13) Anu has 12 red, blue and yellow ribbons. 3 of them are red and 5 of them are blue. How many yellow ribbons does she have? question_answer14) The watermelon is heavier than the papaya by 9 units. Find the mass of the watermelon. question_answer15) I bought an eraser for Rs. 2. I gave the cashier Rs. 5 coin. How much should I get back? question_answer16) Which tub is the deepest? question_answer17) Vignan's school bus arrives at noon. Which of the following clocks show the correct time? question_answer18) 3 tens 8 ones is just after _______. question_answer19) The given pictures tell us a story, but they are not in order. Identify the correct order. question_answer20) Neha took an afternoon nap at 4 O clock. She slept for 2 hours. At what time did she wake up?